1. Launched new version of “Milestone”: Users can view all the major events of WaykiChain since the establishment. Added new section “Team Culture” to show WaykiChain value and share daily work and life of WaykiChain team members.2. Added “Alert” on the homepage. We recommend that investors must check this section. 1. Completed 55% of @Version development; Optimized and enriched game performance.2. Planned to write the growth attributes of economic system and various systems.3. Developed AI system of background.4. Conducted data table simulation iteration; Added VIP system and honor system. 1. Development of various blockchain mini games (70% completed). 2. Completed the support for WaykiBet for overseas activities. .4. Developed SEO and tools development after part of the static content changed to be generated by the background driver. 1. Promoted to collect and confirm blockchain explorer bugs. 2. Changed the color of blockchain explorer to welcome Christmas and New Year. 3. Completed the development of smart contract command generation tool. 4. Completed the faucet interface service so that developers can get the test WICC for free when using the test chain, and get 10 WICC per call. 5. Recorded T2D2 online training course, and uploaded relevant chapters to NetEase Cloud. 6. Completed the primary development of random number seed generation service based on WaykiChain hash values and inverted hash sequences. 1. Fixed the perturbation bug of ledger nodes in the ledger interval to ensure the stability of generating block. 2. Fixed the problem that JSON RPC method getblockcount did not use thread security settings, and now changed to thread security settings to improve interface interaction performance. 3. According to the actual usage scenario, changed the call parameter “ — data-binary” of JSON RPC to “-d”, and changed the value of “Content-Type” from “text/plain” to “application/json”. 4. Modified the three field names and order of the return data of JSON RPC method getinfo, and output them in sequence: connections, received blocks, sync tip blocks. 5. Preliminary fixed the node loss problem that often occurs when initial block download (IBD). 1. Continue to complete the development of blockchain games, the development and testing of the background management system. 2. To develop a general version of the wallet library. 3. To conduct a variety of security and robustness tests for abnormal transaction data. 4. To optimize official website and add importance announcement section and other functions. 5. Continue to advance T2D2 online training. 6. Continue to advance the collection and fix of blockchain explorer bugs. 7. Continue to advance the collection and fix of public chain. 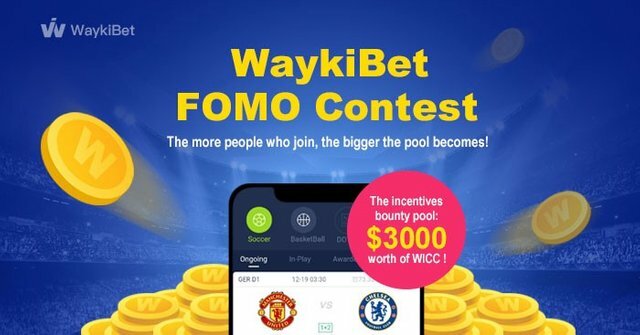 WaykiBet FOMO Contest has been held for one week and attracted over 1000 people to join it. WaykiChain’s technology team increased airdrop amount of test coins on WaykiBet V2.0 from 100 coins per day to 400 per day upon global users’ positive demand. 2. #WaykiXmas- the image posting activity for global community is ongoing. 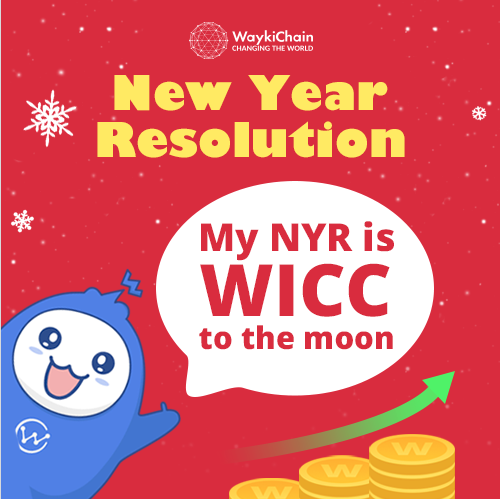 At present it has positive reaction and followers all over the world commented about their new yea’s resolutions, as well as best wishes to WaykiChain under the thread. 3. One of the most influential technology website- Hacker Noon Blog published an in-depth review about WaykiChain. It describes WaykiChain as “backbone infrastructure” for blockchain 3.0. 4. WaykiChain’s overseas marketing team established cooperation intention with world’s leading press agency and global professional cryptocurrency promotion platform. 5. 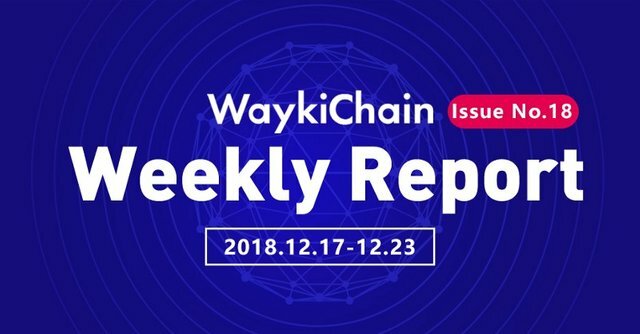 WaykiChain’s Project review (English version) is 90% completed, and it’s estimated to be published this week. 1. Published articles on Tencent Cloud, Baijiahao, Bitan and other we-media channels. Bounty Quizes on Xueqiu is ongoing. 2. Published articles and contents on TouTiao, Bishijie, Jinse and other we-media channels and 11 forum channels. 3. WaykiChain Daily News was updated to issue 94. 4. WaykiChain Official Weibo Account together with WaykiTimes launched Xmas activity. 5. Q &A is constantly updated in developer community. 6. “Blockchain Family” media development was completed. Welcome feedback from the community, so please do get in touch. Want to dive in further? Follow WaykiChain on Telegram, Twitter, and LinkedIn. Plagiarism is the copying & pasting of others work without giving credit to the original author or artist. Plagiarized posts are considered spam. Spam is discouraged by the community, and may result in action from the cheetah bot. More information and tips on sharing content. Warning! This user is on my black list, likely as a known plagiarist, spammer or ID thief. Please be cautious with this post! If you believe this is an error, please chat with us in the #cheetah-appeals channel in our discord. To listen to the audio version of this article click on the play image. Brought to you by @tts. If you find it useful please consider upvoting this reply.